We took advantage of the short break between Christmas and New Year to have a few days away and see what it is like in the Alps during Winter. 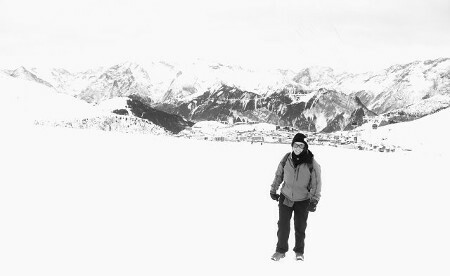 As neither of us ski we set out to see what we could do on foot. Using Grenoble as a base we thought that we would be able to use local transport and visit one or two other towns in the Alps and get a feel of what it would be like to go out onto the snow when we go back to Chamonix next year, although on arrival at the airport we weren't that sure we would be going anywhere, the plane landed on a snow covered runway and with all the roads similarly snowbound the coach transfer was slow and slithery - if it had been London our journey would have ground to a halt. The shuttle bus did make it to the Town centre and with the snow still falling we quickly found our hotel which was handily placed just behind the rail/coach station and checked in before going into the centre for the obligatory shopping. On the way back from the shops we found a nice restaurant specialising in Fondue and Tartiflette, a potato and cheese based dish, Les 2 Savoies was to become our home for the next 3 evening meals. Unfortunately the Tartiflette wasn't vegetarian but we still had plenty of choice with the Fondues and Potato Gratin dishes. As usual for France the request for a meat free salad raised eyebrows even the chef had to come out and have a look at what sort of monsters these vegetarians were, mind you the salad he then prepared was amazing! Unfortunately when we had one of the special 'cheap' set meals the desert didn't quite match up to the other courses, although we should have realised when the owner came up and said with a slightly concerned look on his face "desert is white cheese and cream is that OK?" Not a cheesecake sort of thing then we thought as the waitress put a big bowl of sugar on the table - "to sweeten!". What then turned up was a very milky round white cheese with cream, just like it said on the packet! A little like hard slightly rancid yoghourt, we soon discovered why we had the sugar bowl! Before leaving England we had thought about going from Grenoble to 2 or 3 places for day trips, Briancon, Alpe d'huez and Les 2 Alpes. 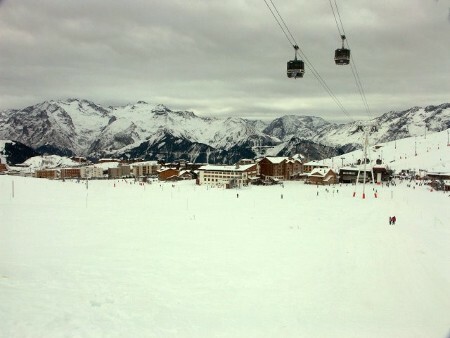 Briancon was a four and a half hour train journey away so for the first day we settled on Alpe d'Huez. Despite the coach being delayed for over half an hour we were looking forward to the trip and excitement increased as the bus started to twist up the 21 hairpin bends towards the resort. We have seen the road on TV before as it is used by the Tour de France, now we know how much of a climb it actually is! The bus reached the top of the village which was bathed in brilliant sunshine, snow and mountains all around along with hundreds of snowboarders and skiers, we seemed out of place in our hiking gear. 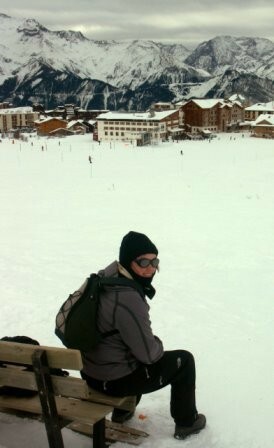 Still we could get a lift pass and go up to the top station on the Pic Blanc. First the view then the cold and then the altitude hit us. Amazing views all around but even walking up the stairs at this altitude was difficult funny how you forget the effect of going from ground level to 3000 metres. We headed back down to the mid station point and sat in the sun watching snowboarders falling onto their backsides, some time later we realised that this might be intentional and the way they stop! Two people walking along the pistes didn't seem to mix well with the downhill skiers but we discovered that there were quite a few snow trails around and having been captivated by the scenery decided to go back the next day and try out a bit of walking. Next morning the weather was completely different, cloud had moved in and by the time we reached Alpe d'Huez the sky was very grey. We set off uphill past rescue snowmobiles returning with fallen ski victims on the back and struggled slowly along the packed snow trails on foot. It wasn't as easy as we thought and the time and weather caught up with us so we opted for a short trek out into the hills and soon discovered that it is essential to keep to the marked trails as I sank up to my knees in snow. As we were making our way back we passed a number of people snow trekking with snow shoes and cross country skiers, something that looked like it could be quite a lot of fun without all of the drama of downhill skiing. Unfortunately our short break was coming to an end so that is something we will have to look into when we are at home and maybe plan for next year.